Perched atop 4.69 acres and around the corner from the Pacific Crest Trail & California Riding & Hiking Trail, this horse enthusiast's must-see property is fully fenced w/a 4-stall, mare motel w/covered hay & feed storage, horse wash rack w/hot water, tack shed, & 2 chicken coops in a fenced 1/4 of an acre free range chicken area. A 13. gpm well serves the spacious home w/wood floors, French doors, old-brick fireplace & mountain views! Optional in-laws quarters within + detached 3-car garage/workshop too!, Nestled in the hills of San Diego's North County is sweet and serene Chihuahua Valley just off Highway 79, not far from Temecula Valley's Wine Country. Large oaks and hills of chaparral welcome you where close-to-120 permanent residents share the star-filled night skies. The California Riding and Hiking Trail, Pacific Crest Trail and acres of BLM and Cleveland National Forest land allow for plenty of room for horses and outdoor recreation right from your front door! For those who crave solitude, just sit and watch the hawks circle and hear breezes rustle the leaves of the ancient oaks. Cruces Drive is 6.5 miles up the gently winding, paved Chihuahua Valley Road to an elevation of about 4,500 feet where snow occasionally graces the area. 37560 Cruces Drive is a fully fenced property with a 3 bedroom, 2 bath home with dual pane windows throughout and a 3-car detached garage which is now being used as a woodworker's workshop and can easily be converted back to housing cars. 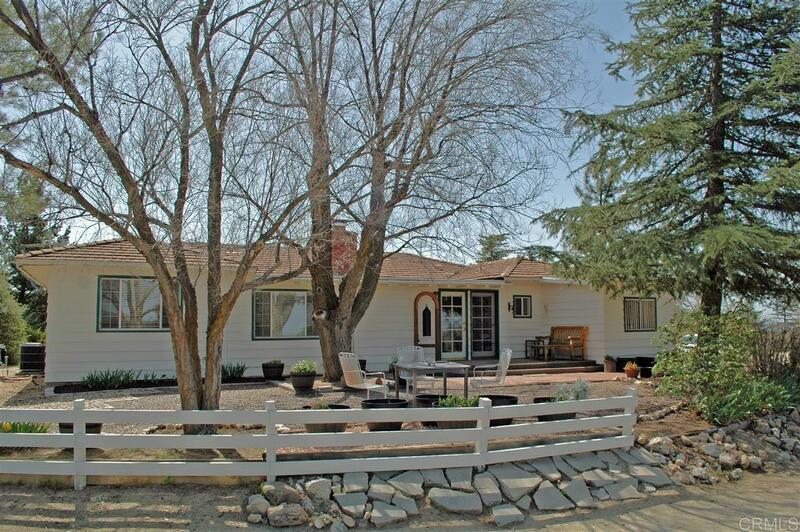 In addition to this bright and open home with spectacular views, there is a 4-stall mare motel, ample water and land for fruit trees and/or vineyard, well/tack room, storage building, and 2 free range chicken coops all on their own completely fenced quarter acre. The country kitchen features a double oven, ample counter tops and a wealth of cabinets. The house features a mud room, double French doors, sun room, laundry room and central AC and heat. Every shopping need you could ever have is about 35 minutes away in Temecula. Live in the small, rural community of Chihuahua Valley with all that shopping just minutes away! Come to where the surrounding mountain views are stunning and the quiet is deafening!